Hobbies: Napping, Humming, Eyes gazing. Boxing - Above-average close-quarter combat boxing-style. Basic Knowledge of Kendo - Self-explanatory, but prefer using whip more. Basic Whipping - Swing and strike, pretty basic skill. Carnage - Can be used to clear up a wide spread of enemies. A continuous swinging and whipping skill - hard to execute, clearance skill - but it hurts the user's main arm from the overused swinging. 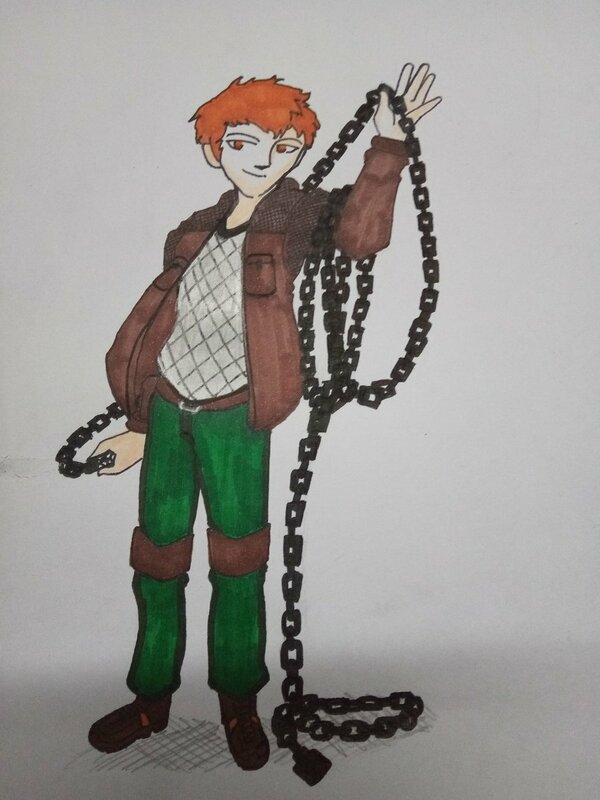 Punishment - Can be used whether an enemy grabbed onto the chain-whip, if the enemy’s light build - can be pulled toward the user, if not, the user delivers the punishment right at them, head on. A satisfying punching skill, but it hurts like hell for both parties. Grapple - Self-explanatory, grapples on the branches of a tree to another tree, movement ability. Can be used in battles, grappling enemies for some punishments, grapple-lifting enemies for some executions. Basic Cooking - Know little about cooking as a whole, but able to burn some to be edible for consuming. Not really bad cook. Extremely Basic Sewing - Know very little about tailoring, the slowest progression skill for him. Go to someone else if needed a decent tailoring. Good Humming - Usually does this after getting excited, or just happiness after a long quest is completed. Ageless - Since he first woken up in the world of Edhellen around the age of late 17, he noticed that he had stopped aging. Mute(?) - He can talk, he’s just shy. Right? Weapons: [Summoned at Will] Dark colored heavy-duty-chain-like Whip. Armors: White shirt, black string vest, short dark red leather jacket, dark green trousers and a hikers' shoes. Platinum unkempt neck-length hairstyle. White eyes. Small alluring adult build. A tattooed black crescent moon-like shapes on her left shoulder, right middle palm. Light skin. Never really show her physical being to others except Valuren. Clothings: Black short dress, light-colored tailored vest. Occupation: Part-time Cashier (formerly), ‘Hummingbird’ (formerly), Adventurer. Amount of wrapping cloth enough for three injured people. [Equipped] (newly acquired/bought) Two sets of cracked and rusty iron daggers. [Equipped] (newly acquired/bought) Water-skin pouch. Little was known about him other than he found himself woken up by the unusual tree sounds in a small forest he first arrived in the world of Edhellen. All he remembered was his name, his old past, his unique abilities and lastly the voices of his inner soul. He had made a small living as a ‘hummingbird’ in a small village nearby, earning him with enough to stay alive. The townspeople loved his humming songs, all of which came from the world he was born and raised. Later in his new life in this world, he journeyed across the plains to find himself a new place to stay, the town of Nagrand. The travels was far, but with his unique skills to cast out a whip weapon for his own. It was enough for him to safely arrive to the town, with little injuries. Now, he’s interested in becoming an adventurer - while still wondering about his parents back home.